Rebel Jaffa have found a temporary refuge at the Alpha Site, and when a Tok'ra base under the command of Malek is overrun by Anubis, the surviving Tok'ra also flee to the Earth's secret base. The Tok'ra and the Jaffa have long been enemies, and the peace between them is an uneasy one. Tension is high, and suspicion increases when acts of sabotage begin to occur. Someone tampers with a naquadah reactor which, left undetected, could have destroyed the base. O'Neill orders the base secured, and the Tok'ra offer the use of their zatarc detector in an attempt to identify the saboteur. Suspicion grows when Ocker, the Tok'ra head of security, is found murdered. The prime suspect is a Jaffa warrior named Artok, until he too is found murdered in his holding cell. A search is initiated beyond the compound, but the mysterious attacks continue, and one of the search parties is also found dead. Bra'tac is attacked by an invisible force and is dragged off into the forest as Malek delivers the horrifying news that he fears Bra'tac is dead. Evidence suggests that the unseen enemy is an Ashrak, a Goa'uld assassin in the service of Anubis, who possesses a personal cloaking device. 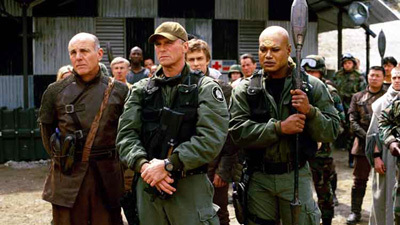 The stargate is heavily guarded, and Carter and Malek construct a high frequency generator to counteract the cloaking technology to make the assassin visible. The Ashrak attempts an escape through the gate, and in the firefight, many are wounded. As the Ashrak shimmers into visibility, he lunges once more for the gate, but is struck by staff weapon blasts to the back. He collapses, revealing that the shots came from Bra'tac, weakened but alive, who has returned to the base. Bra'tac exhorts the Jaffa, the Tok'ra, and the Tauri to put aside their ancient differences at last and to unite in fighting their common enemy, the Goa'uld. The planet was chosen for the Alpha Site because its address is unknown to the Goa置ld. The Tok池a base in the Risa system was attacked by the forces of Anubis. The Ashrak is a highly trained Goa置ld assassin of great strength and power, most likely in the service of Anubis. Many Jaffa in the service of Apophis had been killed in the same manner in the naquadah mines of Kawawn. The zatarc detector will reveal any lie or deception whether someone is a zatarc or not, however, it can still give false positives. A Jaffa would not kill from behind. Vengeance is exacted face to face. Carter made the invisible Ashrak visible by generating a high frequency electromagnetic field by modifying the wave output of the naquadah reactor within a range of 400 to 700 nanometers to excite the phase particles enough to bring them into the visible light spectrum. Arik tree-ac te kek: We do not surrender, even in death. Tak mal arik tiak: You will not be forgotten. Major Pierce is the commanding officer of SG-15. All of SG-12 was killed in the first wave of a surprise attack by Anubis on the Tok池a base. Jonas had been with SG-2 gathering artifacts from P36-231. Artok wears the eagle tattoo of Heru置r. Bra稚ac is 137 years old.